W Aaron Waychoff, creator of the Falsom Upside-Down ⊥ "Resist" campaign, was inspired by this 2016 post; he writes, "I've made a proof-of-concept encrypting digital camera based on the open source, widely adoped GnuPG. 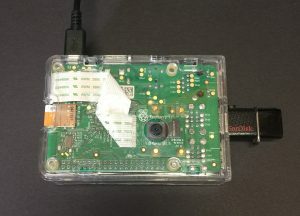 This project uses public key encryption to encrypt every photo the camera takes before writing the encrypted version to memory. Of particular note, there are absolutely no UI changes over what an ordinary point-and-shoot camera provides. No extra keyboards or touch screens are needed as no passwords need be entered." Note that with this setup, a journalist (or other user) need not even have access to the private key while in the field - or at all should a trusted other party be given the task of generating the keypairs. The main goal of this project was to show that encryption could be made available on many current cameras with only a software update. There are caveats to be sure, but should the user choose to live with the tradeoffs (speed, lack of image review) then they should have these important features available. And they could! I would especially love to see CHDK (The open source Canon firmware alternative) support something like this.